With the temperature hovering right around the freezing mark, and the sun shining, it felt like a hike out to Webster’s Falls was in order. 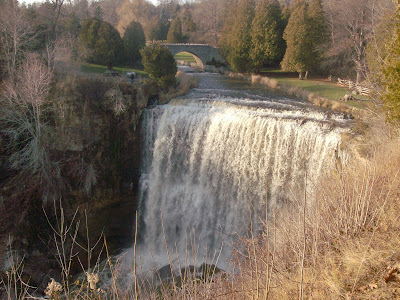 Of the hundred or so waterfalls in the Hamilton area, Webster’s Falls is likely the best known and with a large park area around it is an ideal spot for a days picnic. In the summer I like to hike into the falls from the lower trail, starting at the rail bridge where it meets King Street in Dundas and approaching the falls from the bottom. This is a spectacular hiking trail in the summer but can be slippery and difficult to hike in the winter. Webster’s Falls is located in Spencer Gorge Wilderness Area, and is part of the Niagara Escarpment, declared by the United Nations (UNESCO) as a World Biosphere Reserve. This unique geological formation contains two of Hamilton’s best waterfalls, one of its best lookouts, and hundreds of species of wildlife living in this Carolinian forest. 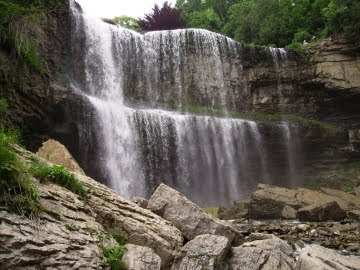 Webster’s Falls is 22 metres (75 feet) high and is one of two waterfalls in the immediate area, with the other, Tew’s Falls, a short hike away. It is created where the main branch of Spencer Creek empties into the gorge. From the top of the falls, there is a series of stairs that you can take to get down to the base. There are a number of good vantage points for photography. The area also features a beautiful cobblestone bridge which was built in 1936 and restored in 2000. As the Bruce trail meanders through this area, there is an abundance of main and side trails offering spectacular views of the valley below. This is a beautiful area and worth a visit regardless of the season. To get to Webster's Falls, take Highway 8 from Dundas going up to Greensville. Keep right on Brock Road and turn right onto Harvest Road. Turn right on Short Road, then left onto Fallsview Road. The parking lot will be on your right. I like that the hike to the falls is not to long for most children, or you can take a longer walk up to the look out.